Code-switching – the alternating use of two languages in the same stretch of discourse by a bilingual speaker – is a dominant topic in the study of bilingualism and a phenomenon that generates a great deal of pointed discussion in the public domain. This handbook provides the most comprehensive guide to this bilingual phenomenon to date. Drawing on empirical data from a wide range of language pairings, the leading researchers in the study of bilingualism examine the linguistic, social and cognitive implications of code-switching in up-to-date and accessible survey chapters. 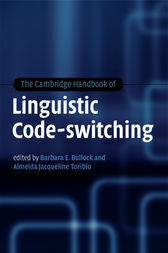 The Cambridge Handbook of Linguistic Code-switching will serve as a vital resource for advanced undergraduate and graduate students, as a wide-ranging overview for linguists, psychologists and speech scientists and as an informative guide for educators interested in bilingual speech practices.